Posted June 11, 2007 in Articles and Quetico Park People. Vera and Joe Meany at Lac la Croix Ranger Station in 1978. Their many summers in Quetico aided them in advising canoeists about the rapids on the nearby Maligne River and other areas where problems can be encountered. They were also reliable sources of information on fishing, wildlife, pictographs and campsites. One of the real benefits of having Ranger Stations on the edge of Quetico, with knowledgeable people like Joe and Vera manning them, is the opportunity it gives canoeists to find out the current conditions of portages, the places where bears are causing problems, and other up-to-date and accurate information. A canoe trip into Quetico can be a daunting adventure, especially for novice canoeists. Through their efforts, the Meanys made Quetico canoe trips a safer and more enjoyable experience for thousands of people. Because of the assistance they gave to Boy Scouts from Omaha, Nebraska and other Nebraska canoeists, they were made honourary citizens of Omaha, Nebraska by the town’s mayor. Joe took a round-about route to Quetico Park. He grew up in Kirkland Lake, Ontario and started working as a diamond driller when he was fourteen. He celebrated his fifteenth birthday working in Pickle Crow and worked in underground mines in Kirkland Lake until he was old enough to join the army. He served 5 years in the army, including eighteen months in Korea. Vera grew up on Prince Edward Island and later moved to Toronto where she worked with Joe’s sister. She and Joe were married in 1955 and in 1960 they moved to Atikokan where Joe worked in the iron ore mine. Since arriving in Atikokan, their lives have revolved around canoeing. Joe became one of Canada’s top canoe racers and in 1963 teamed with former Atikokanite, Eugene Tetreault, to win the Canadian Professional Championships. Joe won it again the following year with his brother, Don Meany. Don, also an Atikokan resident, now makes bent-shaft canoe paddles with his son, Spencer, that many consider to be among the best in the world. To help mark Canada’s centennial in 1967, Joe was part of a three-man crew that paddled a kayak from Edmonton to Montreal in forty days. The race, however, that still puts a glint in his eye and animation in his body is the 1964 Atikokan to Ely race. In 1964, Joe and Eugene Tetreault won the marathon race from Ely, Minnesota to Atikokan, and after a days rest, back to Ely. This race, which passed through the centre of Quetico Park, was one of the premier canoe races in the 1960’s. Ralph Sawyer called it the “ultimate canoe race” because it required day and night paddling, crossing a wilderness of lakes and rivers, and had numerous portages. In 1964, the race involved paddling from Shagawa Lake in Ely to Atikokan, resting a day in Atikokan, and then returning to Ely. Racers could take any route they wanted but there was a route that virtually everyone used because it was believed to be the fastest route. Joe and Eugene, however, decided to shorten the normal route by cutting portages through a low, boggy area between Alice and Fern Lake. A combination of terrific paddling and their shorter but more difficult route brought Tetrault and Meany the victory in the 1964 race. The legacy of that race lives on in Quetico. The southern portage they cut was named “Bonne Homme” Portage (French for “good man”) after Eugene Tetrault. The northern portage that leads to Fern Lake was named “Sauvage Portage” after Joe Meany. It was originally named “Maux Jit Sauvage” but it was shortened to “Sauvage Portage”. Unfortunately, only the name was changed, the portage remains as long as ever. Both portages are difficult to find, very long, bug-infested, and are knee deep in mud in places. There is a joy, however, in completing them and they do connect two beautiful lakes with seldom visited, scenic, small lakes between the two portages. Joe has never lost his desire to paddle long distance, and in 1985 he kayaked with his friend Keith Burand around the southern half of Quetico. They paddled non-stop for 34 hours to cover the 200 kilometres and 27 portages. The legacy of Joe’s racing days is still evident in the paddling style of the portage crew who work in Quetico. The Quetico Park portage crew use the “hut stroke”. They steer by switching sides instead of using the j-stroke and, consequently, all their effort goes into forward motion. Many paddlers in Quetico recognize the portage crew from a distance because of their distinctive, efficient paddling style. Joe’s love of canoeing, love of Quetico, and his job as a Quetico Park Ranger were a perfect match. Vera was always the main office worker, she kept the office running smoothly and efficiently. She also played a central role in helping others, my wife and I included, in dealing with the complexities of running a Ranger Station. She and Joe also raised two sons, and one former portage crew member told me that “Vera became a second mother to me”. A whole generation of young men and women working in Quetico as volunteers, Junior Rangers and portage crew describe Vera as their surrogate mother during their summers in the park. Providing meals for portage crew, volunteers, Junior Rangers and canoeists who happened to stop by when meals were being served, goes well beyond the job description for park station attendants. Vera, however, was always generous with her time, her advice and her food. Vera was also renowned for her home remedies for a wide variety of ailments. These came in especially handy when a child living at a ranger station got sick and a doctor, or even medical advice, was hard to come by. Over the summers the Meanys were at Lac la Croix, Quetico Rangers got recipes for cough syrup made from onion juice, a cream for rash made from corn starch and lard, and a remedy for canker sores. One summer when we were at the Beaverhouse Ranger Station, we ran out of shampoo and Vera called us with a recipe for shampoo made out of mayonnaise, lemon juice, and dish detergent. Joe and Vera made numerous improvements to the Lac la Croix Ranger Station and the surrounding structures. Their main addition was a log building made from red pine logs that Joe obtained from a variety of locations on Lac la Croix. Joe got permission to build a woodshed from park authorities and he then proceeded to build a log building with an attached woodshed. During the time Joe and Vera were at Lac la Croix, it was known as “Ranger Hall”. It functioned as a museum complete with a large number of photos and articles relevant to the history of the park. Many canoeists made a point of seeing the Meany’s at Lac la Croix every summer. If they didn’t start or end their trip at Lac la Croix, they planned their trip with a stop to see the Meany’s as part of their itinerary. At Cache Bay and Prairie Portage Ranger Stations we periodically met people who were paddling long distances across Canada. It always seemed that they had either just had an extended visit with Joe and Vera or were on their way to see them because someone along the route had told them that the Rangers at Lac la Croix were people they “absolutely” had to see to make their trip complete. Vera and Joe always had a large, well-used coffee pot and over the years many canoeists had a hot cup of coffee while describing aspects of their canoe trip while waiting for a towboat or a flight back to Crane lake. Joe and Vera especially enjoyed talking to people at the end of their trips when the days and nights in the park have mellowed people and made them eager to share their experiences. As to the multitudes of cups of coffee that have been consumed, Joe said that he had found that “when you give a cup, you get a pot back”. Vera and Joe Meany at their house near Atikokan in July, 2006. In 1996, their reign at the Lac la Croix Ranger station came to an end. The Meanys became part of the fabric of Quetico during their twenty four years at Lac la Croix. They are part of the Park Ranger tradition that includes people such as Bill Darby, Ted Dettbarn, Lloyd Rawn, Art Madsen, Bob and Evelyn Halliday, Mike and Priscilla O’Brien, Webb and Berniece Hyatt, and numerous others. The Quetico wilderness is indeed composed of men and women that are a match for the magnificent landscape they inhabit. I have been a Quetico devotee since 1956. My brother, Howard, and I participated in the First International Canoe Derby in 1962, placing third in that event. I am in the process of writing an article about that race. The Quetico is an integral part of my life and is my spiritual home. 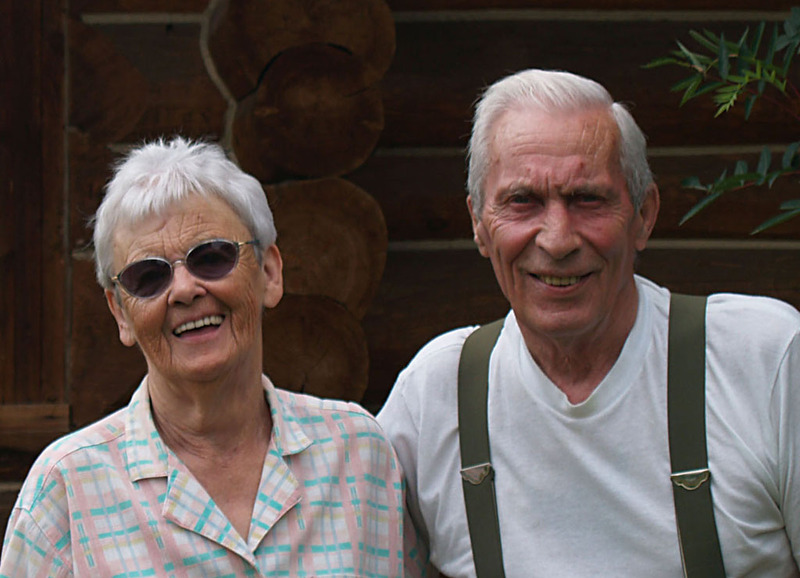 Joe and Vera Meany helped to make Quetico a truly wonderful place. My dad was Ross Williams and the Meany brothers gave him a number of their early paddles. Before he died in 1987, he gave each of his sons a couple of paddles. We have two beautiful examples of the early bent paddles. We used them years ago but they are now proudly diplayed in our home. Do you have an email so that I can contact one or both of the brothers? He was nervous about lake travel and wore a big life jacket on the way down. Hello to David Williams (contributer above) son of Mr Ross Williams – he and his twin brother Lloyd and mother and father were close family friends. I have lived in BC since 1973 working on the Coast as a Area Engineer in Haida Gwaii and Central Vancouver Island but my heart has always been in Quetico Park where I spend many years. I lived across the highway from Nym Lake having moved to our newly built house in 1957. Joe and I were Boy Scout leaders in Atikokan in 1965. Glad to see that everything went well since. Thanks for teaching me how to sing Barret’s Privateers Joe. Always will remember you.